One of the managers of Ax-Man, Ben, helps a pair of customers at the register. Packed into an old building at the corner of University and Fry, Ax-Man Surplus does not seem particularly noteworthy from the outside. Walking in, a potential customer is bombarded with a number of seemingly unrelated items. Several mannequins are waiting to greet the customer, dressed in whatever clothes the staff found lying around. These and a number of other goods are for sale: a crate of bowling pins, a bike, a box of umbrellas, tiny bells, garbage cans, a very-used nightstand, several rolling chairs, a giant model horse with a saddle, a giant scale, and a can crusher. And this is just walking through the entrance. Ax-Man Surplus has lasted decades on University Avenue, now surviving light rail construction with the help of a unique approach to business and a loyal customer base. “No two days are the same, that’s for sure. 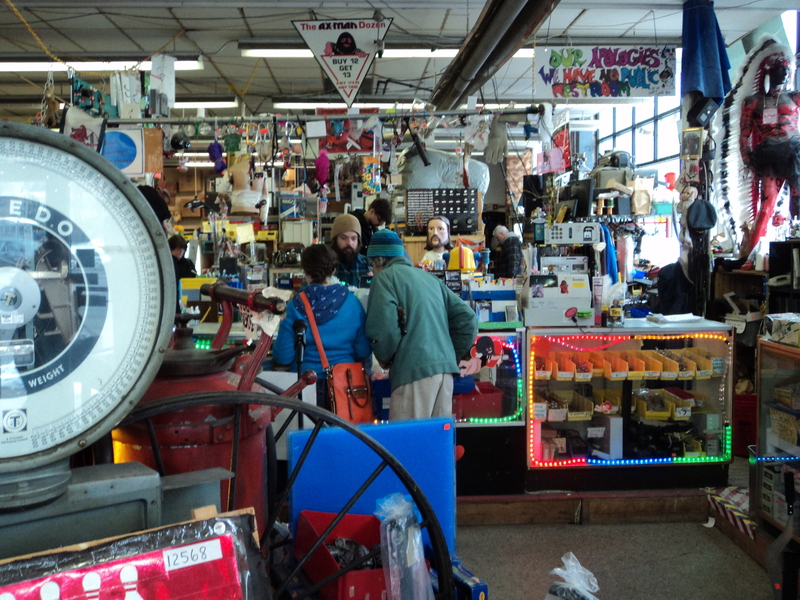 It’s not mundane or ordinary, there’s a lot of variety,” noted Jim Segal, the owner of Ax-Man since 2000. One aisle’s sign advertises “lighting, bags and mailers, tape and hardware.” But hardware is not very descriptive for Ax-Man, with perhaps a fifth of the store’s products falling under that label, and besides that the aisle also features random pieces of foam and office supplies for sale. Some aisles have no signs whatsoever. It does not, on its face, make sense for a business to advertise numerous products it has no intention of selling. Even what the store does sell is sold cheaply. It may seem like bad economics, but the culture of Ax-Man has engendered an intense loyalty among its customers. On a good day, one can find more than thirty people shopping in the store at once. Even on a Sunday evening with heavy snowfall that left the roads slick and kept most people in their homes, about twenty people came through the doors in the short span of thirty minutes. That loyal customer base was critical during light rail construction in the area. Today, this section of University Avenue is largely complete, but during 2011 and 2012 local businesses felt adverse effects from the project, including customer parking shortages, general congestion along University Avenue, and power outages. Segal, a member of the board of directors of the University Avenue Business Association, anticipated major problems as construction began. At one Metropolitan Council public hearing on the light rail project in 2011, Segal criticized a recent report describing the impact of the construction on local businesses and predicted Ax-Man would lose $100,000 in revenue during the first six months of construction. A December 2012 report released by the Metropolitan Council in response to a court order criticizing the 2011 report quantifies some of the business loss. A total of 76 businesses left University Avenue or shut down during construction, while 73 opened new storefronts along the corridor. Further, among businesses qualifying for support from the Business Support Fund, stores lost an average 30 percent of sales. Segal credits Ax-Man’s loyal customers with the relative success of his business. Among those customers interviewed, nobody reported visiting Ax-Man less frequently due to the construction. “That [the light rail construction] has nothing to do with it,” said Tim Hintz, a bearded man in camouflage pants who has visited the store since his dad brought him as a young child. He frequents the store regularly despite living in Eagan. Even the employees are often long-term customers. Likes discovered Ax-Man as a customer, and today he works in management for Ax-Man. When he moved to the Twin Cities twelve years ago, “It was the first job I went for,” he said. Some customers, like Robert Oveson, intend to raise the next generation of Ax-Man customers. “I’ll be coming in as a decrepit old man bringing my grandkids in here,” he said.